One of the most popular activities in the High Country area is hiking. There are many wonderful trails located all over the area for every level of hiker to take advantage of. Moses H. Cone Julian Price Memorial Park on the Blue Ridge Parkway is a favorite spot with popular trails such as Boone Fork Loop and the Tanawha trail. On Grandfather Mountain in the Linville area, there are many popular and well traveled trails. Many of these trails are meant for more experienced and well conditioned hikers. The Linville Falls Trail is a pretty tough hike but the effort is well worth the amazing views of the Linville Gorge. There are dozens of more casual hiking trails all over the High Country area as well. Young and old alike can take advantage of these beautiful and rustic trails but keep in mind that while most trails are well maintained, others are not maintained at all. 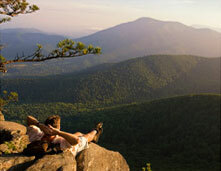 Hiking in North Carolina is a great way to get outdoors and explore the various wonders of the Blue Ridge Parkway. Always be sure to wear the appropriate shoes and clothing for the type of weather and trails you are hiking. Even the most experience hiker can get hurt or lost in the forest. Changes in the weather and terrain can catch you off guard and most smart hikers take along basic survival gear just to be on the safe side. A pocket knife, compass, trail maps, a change of clothes and a little extra food is always a good idea to carry with you. Hiking is perhaps the best way to experience the beauty of the High Country and it's also educational, physically beneficial and inexpensive. We sell Banner Elk Real Estate and Linville real estate located very close to the Blue Ridge Parkway and other great hiking locations across the NC Blue Ridge Mountains. Take a moment and browse through our listings of NC Mountain Homes and NC Mountain Land for sale, we are sure you'll find something you fall in love with. Come to the mountains and discover the relaxed lifestyle you've always dreamt about. Another popular way to see the beauty of the outdoors in the Appalachian Mountains is by biking. Boone NC mountain biking and biking around the area has gained popularity among residents and visitors of the High Country. Each year the High Country plays host to several bike races and biking events that are becoming popular among mountain bikers everywhere. One popular race is the annual Blood, Sweat, and Gears challenge. This event is grueling, including a 21 mile portion of the Blue Ridge Parkway. Some have called the race "100 miles of pure hill". There are a number of trails to ride in the Boone, Blowing Rock, and Banner Elk areas. The Benson Hollow trail is located in Blowing rock and is considered the 2nd Best Mountain Biking Trail in North Carolina. Some of the local ski areas service mountain bikers in the Ski off-season. Sugar Mountain Resort provides a lift service to mountain bikers, where you can bring your bike and ride the lift up the mountain and then practice your downhill skills.